Flames and smoke billow from the Notre Dame Cathedral after a fire broke out in Paris April 15. Officials are unsure of the cause of the fire, but suggested it could be linked to renovation work. Flames and smoke billowed from the Notre Dame Cathedral after a fire broke out in Paris April 15. Officials said the cause was not clear, but that the fire could be linked to renovation work. The fire erupted about 6:30 p.m. local time (11:30 a.m. St. Louis time). Authorities said the cause was not certain, but that it could be linked to renovation work that the cathedral was undergoing, the BBC reported. Archbishop Robert J. Carlson issued a statement on the fire April 15. He wrote, "The Archdiocese of St. Louis joins the world community in offering prayers for the people of France. The influence of the French faithful on the St. Louis community is well known. Our own Basilica of St. Louis, King of France is representative of that historical link we have with the French community. Our hearts are with the firefighters and with the caretakers of the magnificent Cathedral of Notre-Dame de Paris. We ask for the intercession of Mary, Mother of God and look to the promise of Easter hope and new life in the midst of this difficult loss." 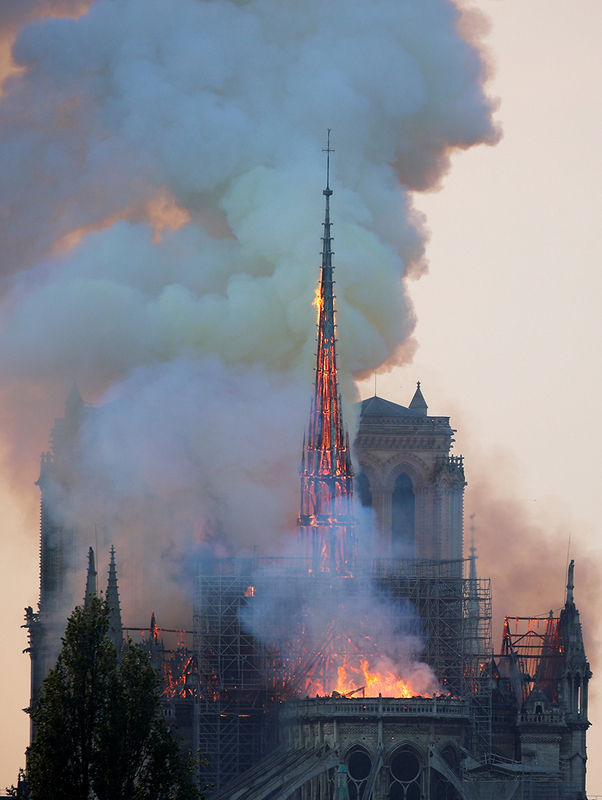 “The horrific fire that is engulfing the Cathedral of Notre-Dame de Paris is shocking and saddens us all, for this particular cathedral is not only a majestic church, it is also a world treasure,” stated Cardinal Daniel N. DiNardo of Galveston-Houston, president of the U.S. Conference of Catholic Bishops. “Noble in architecture and art, it has long been a symbol of the transcendent human spirit as well as our longing for God,” the cardinal wrote in a statement April 15. “Our hearts go out to the archbishop and the people of Paris, and we pray for all the people of France, entrusting all to the prayers and intercession of the Mother of God, especially the firefighters battling the fire. “God preserve this splendid house of prayer, and protect those battling the blaze,” he prayed.